I looking for very reliable car, for long trips in foreign countries, where I don't want my car to leave me on the road by some reason. Can you, please, suggest any mechanically proven GT/SUV cars? Thanks. 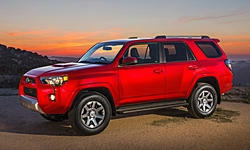 Especially if the roads will sometimes be in poor condition, it's hard to beat the Toyota 4Runner (or equivalent in the country in question). Ride quality isn't the best, though. Personally i would stick with anything toyota.. They are generally rock solid reliable and can be beaten on pretty hard before you have a glimpse of any issues.. I have never been left stranded in a toyota.. and have driven one of them to 982K miles without anything outside of normal wear and tear replacement parts and oil changes.. I third the 4runner. Depending on where you're headed the Toyota is bulletproof and if you get the fancy KDSS it is a bit more forgiveing with the bumps and what not. I think overseas it's the Hilux. Other than that it'd either be a Defender or a Wrangler, but reliability as well as comfort are compromised.